It’s Spring Break for me and it’s time to reflect on my own blog, started 5 years ago while I enjoyed a similar break from school. The blog was originally created for a targeted pilot group of 13 teachers I was working with to explore ways they could use a laptop and Web 2.0 for teaching and learning. We were just getting started. Most teachers did not have school issued laptops, we were limited to options available in a 1 computer classroom, and Web 2.0 tools were not as abundant as they are today. In fact, the iPad was not yet invented. Blogging about experiences makes me accountable for taking the time to thoughtfully reflect on teaching and pursue ways to kick the learning up a notch. I learn more from blogging than from any other professional activity I participate in. Quite simply, I blog to learn. Becoming a blogger is perhaps one of the most powerful ways to grow as an educator. For many, blogging can become an essential part of the workflow, requiring us to dig deeper, engage in research, explain and reflect. Good blogging should include exploring the blogs of others as models, and sharing ideas and resources with your audience. The audience may be students, teaching teams, parents, or educators across the world. Blogging will ultimately help you become a connected educator. Start simple! A new blog will have just one post. Write the post for yourself to explain why you have decided to start a blog. Since it takes time and effort to get people to check a blog, do not spend hours and hours filling your blog with information. Just use the blog as a tool for yourself, but write it for an audience. As you continue to experiment with blogging, explore the use of simple original images to capture visitors’ attention. Model good digital citizenship. 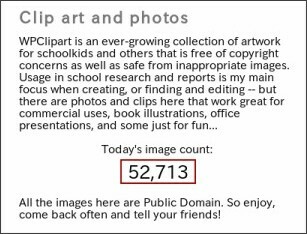 We expect students to use copyright-friendly images, credit sources and share their own original work, and it’s important for education bloggers to dig deep into Best Practices and try it yourself. Throughout the course of my career as a blogger, I have helped many teachers get up and running with a blog. Here is my advice, based on The School of Hard Knocks, so to speak. Start simple and build your toolkit of resources. Demonstrate good digital citizenship by crediting sources. Learn to create simple original images. Try WPClipart for a jump start. Explore the blogs of other educators for inspiration. Here is an example that includes the Get Started steps explained below the image. The simple toolkit of resources used here includes WPClipart and Kwout. The image you see here is embedded in the post. The source of the image is properly credited. I used Kwout to quote the image with an image map. This push-button bookmarklet tool is a good tool for modeling digital citizenship, since it includes links at the bottom of the image. I created a simple original image, with WPClipart to attract the attention of visitors and included it at the top of this post. 5 years is a long time in the world of EdTech, but this blog has continued. It has evolved and grown with me over time because it is a flexible tool. This blog is expected to hit the 1,000,000 visitor mark this year. Blog on, educators!